The real work of Earth Day was done last weekend with a massive volunteer effort throughout Central Ohio. Almost 4,000 volunteers picked up trash, planted trees and worked in community gardens. Events like Thursday’s Earth Day celebration at Franklin Park are a forum for inspiration and education. The event gives non-profits and eco-friendly businesses an opportunity to explain their products, missions and campaigns. By trying to achieve a zero waste event we can teach people about recycling and composting and by offering healthy, sustainably produced foods we can introduce people to some fast food alternatives. 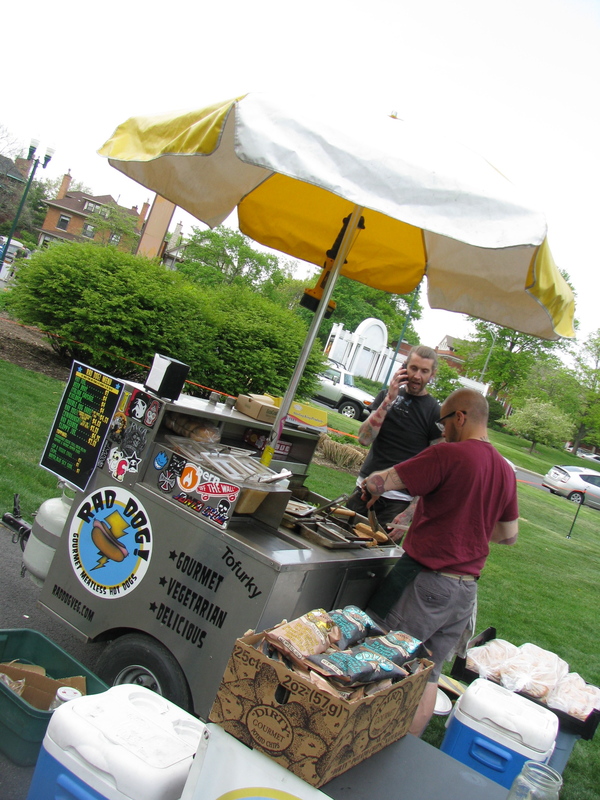 When I was asked to organize the food vendors for the Earth Day celebration, I started to think about the sort of vendors that would appeal to me at such an event. I wanted to focus on local, independent businesses and make sure that there were plenty of options for vegetarians and vegans. I knew we would need to have more food options than previous years, because there are so few options close to Franklin Park. 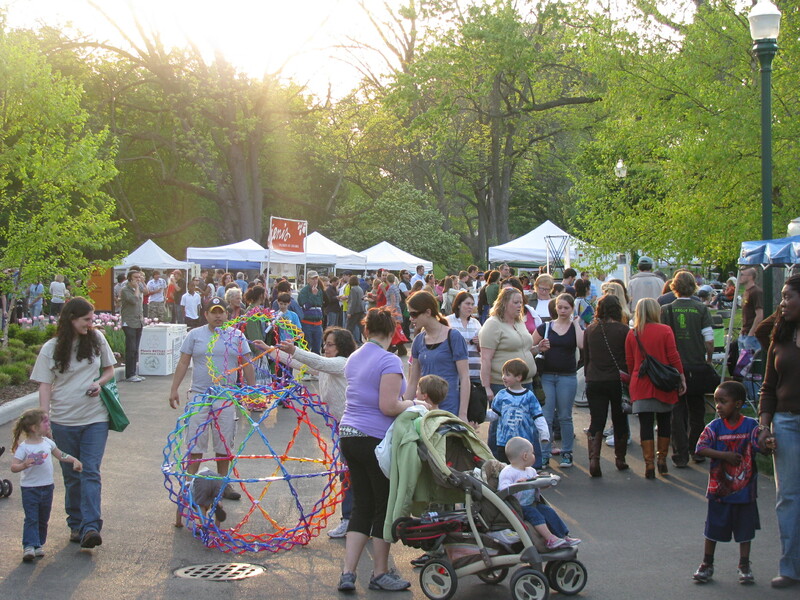 As this was the 40th anniversary of Earth Day we were hoping for more attendees than previous year’s, and if you want people to stay and listen to music on a weekday evening, chances are they are going to get hungry. I remembered that the Columbus vegetarian restaurant blog Nothing Better to Do had featured a Comfest dining guide, so I contacted them to solicit some ideas. 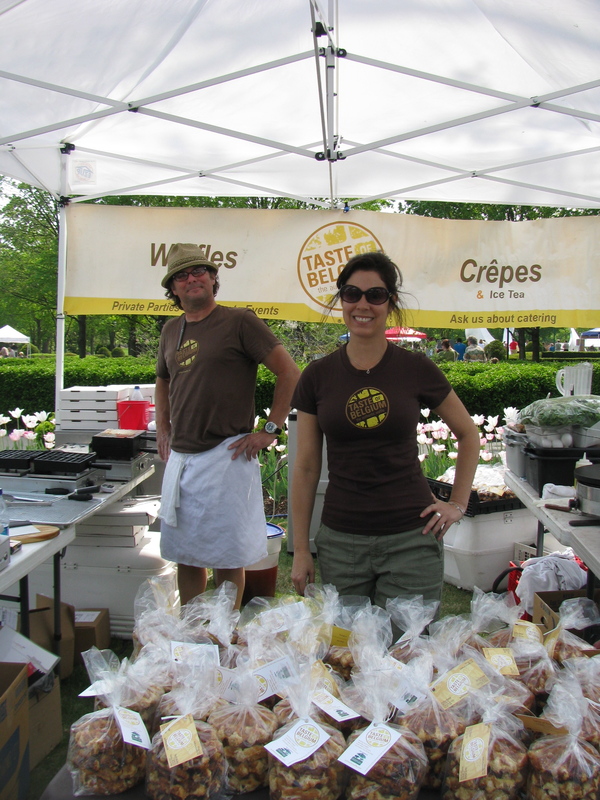 We invited some Comfest veterans: Dragonfly and Wellness Forum as well as some of the favorite vendors from previous years: Wholefoods Market and Rad Dog, who were the first vendor to sell out. Another vegan option were the soups and turnovers from Lucky Ladle. I was a fan of the potato and spinach turnovers. Poor Shannon had her umbrella stolen the night before, but she was still all smiles. You can catch her at some of the farmers markets this summer. 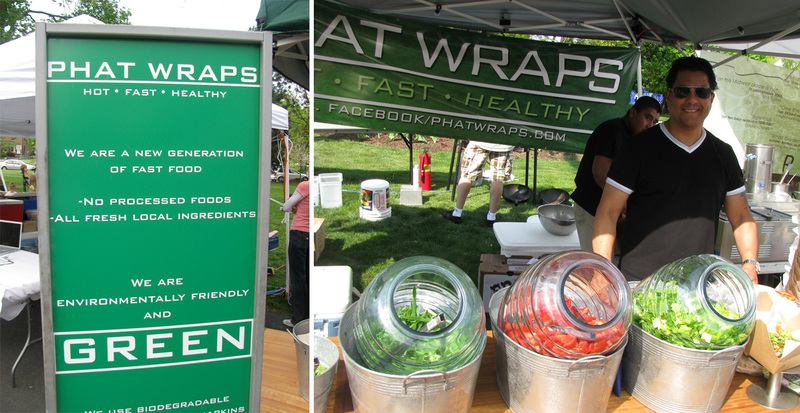 Phat Wraps had an enticing display with all of their fresh toppings and they proved to be another popular choice. It’s fun being able to customize your own food. Their permanent location is in the OSU campus area on North High Street, but look for a second location opening soon. A couple of festival newcomers were Portia’s Creations, featuring Kombucha Bob and Skillet Rustic Urban Food, debuting their new trailer. 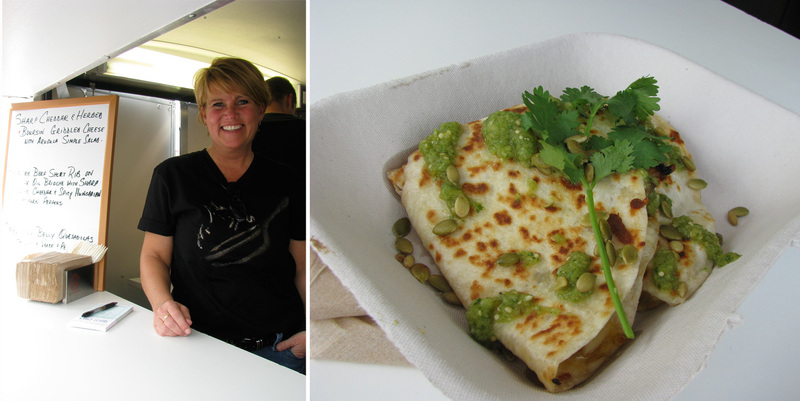 The pork belly quesadilla with salsa verde from Skillet was my late lunch, and it was delicious. Skillet is a great example of local, seasonal sourcing and they work directly with a number of farmers. I look forward to seeing the trailer out on the streets again soon. A special thank you goes to Jeni’s Ice Creams and Columbus Brewing Company who gave out free scoops of ice cream and beer to volunteers. It’s amazing how long people will stand in line for a free scoop of ice cream, but it is wonderful stuff. Jeni’s is doing great work teaching people about seasonal eating through the medium of ice cream. 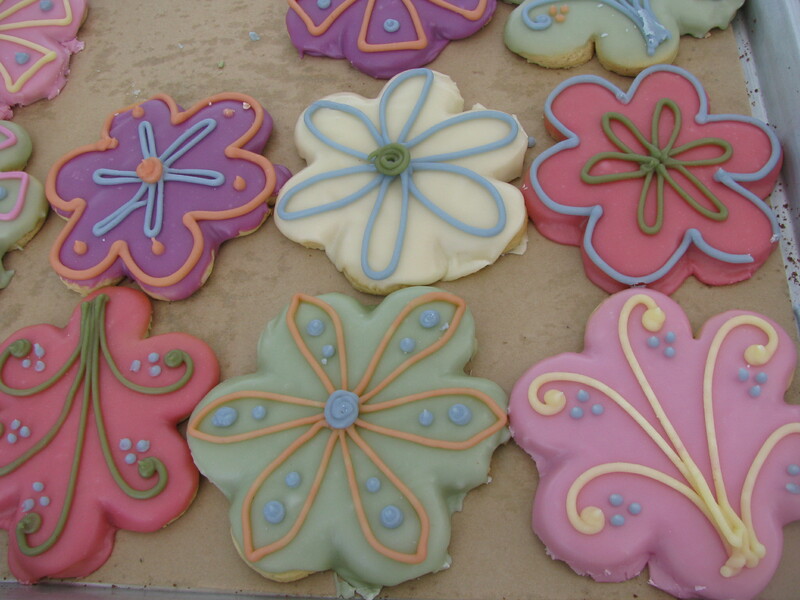 It’s almost time for flavors that bloom. Thanks also to all of the volunteers at the festival and the ever-patient Franklin Park Conservatory staff, especially the electricians. Some other food highlights awaited those that made it over to the community garden. 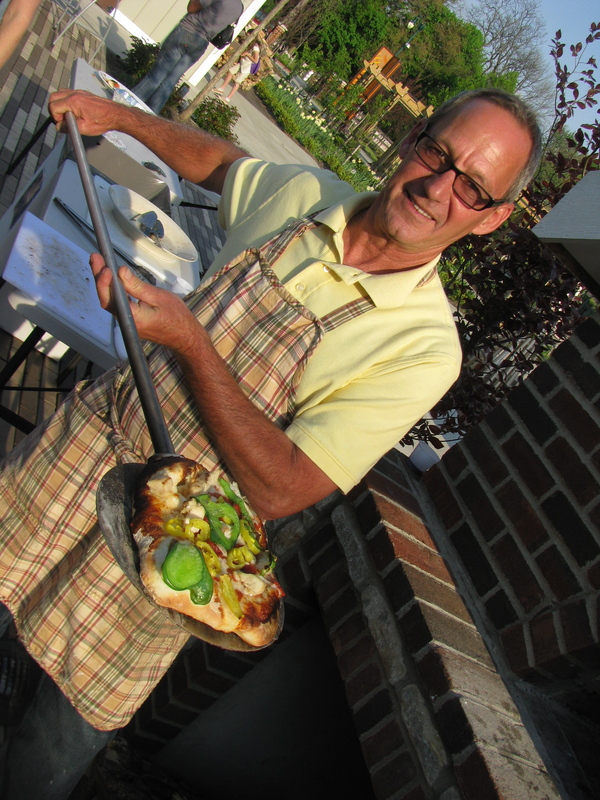 The live fire cooking theatre was in full swing and we found garden guru Bill Dawson showing off pizzas fresh from the outdoor oven. Inside the education pavilion were a series of cooking demonstrations. I only made it to one, but I did get to listen to Devon Morgan (pastry chef at Alana’s) teaching us how to reuse and recycle ingredients in the kitchen. Devon showed us how to make chocolate nut balls with leftover cake trimmings and that’s the sort of recycling anyone can get behind. Some more photos from the event are on flickr. September has been a month jam packed with food events and it shows no sign of abating. I don’t want you to think that I am complaining, I’m not, I’ve been having a great time and lots of wonderful experiences. The title is a homage to the first event I want to mention, a panel of Columbus Food Bloggers at Wild Goose Creative. This post is going to be an overview of a lot of fantastic food events that could all have been posts in their own right, if I wasn’t so busy going to food events that I don’t have enough time to write. Back to Wild Goose. The Food Bloggers on the panel were Columbus Foodie, Dave from Weber Cam, CMH Gourmand, Rosie from Bitchin’ in the Kitchen, Zach from Columbus Foodcast, myself and Nick from Breakfast with Nick, a selection of the active food bloggers in Columbus. I was pleasantly surprised at how many people came to listen to a group of food bloggers. Each blogger introduced themselves and explained why they started blogging and the focus of their blog. It was interesting to share stories and it didn’t take long before we were sharing recommendations for new places to eat. There were some thought provoking questions including how blogging interplays with traditional media and it was a shame that time prevented a more in-depth discussion of the issue. Each of us brought some food to share that related to our blog. Marmite seemed the obvious choice as it appears in my Hungrywoolf logo, is British and is one of my favorite foods. I remembered a recipe for Marmite cheese straws from the last issue of BBC Good Food magazine but unfortunately being a voracious recycler, the magazine was already gone. Internet research provided some ideas but of course, I am not sensible enough to do a practice run and thus on the afternoon of the event I was still hoping that they would all turn out alright. I tried hearts, pinwheels and eventually found that twisted sticks worked the best. The recipe was simple: frozen puff pastry, mature cheddar cheese, butter, marmite, a hot oven and a prayer that people would like them. I didn’t see too many left on plates, so it seemed that they were well received and I think I may have converted some people to the joy of Marmite. Labor Day was spent laboring. Not a food ‘event’ but certainly food related, we spent the day helping to pick and wash pumpkins at AD’s parents Farm. His Father grows over 50 varieties of pumpkins and squash, so I was in squash heaven and came back with a huge bag full. Some of the varieties I wasn’t familiar with and I was excited to discover that one of them, Green-striped Cushaw, is an Ark of Taste Food. I hadn’t thought much about squash and pumpkins needing to be washed before they are sold, although it seems obvious now. I grew up in a city, so this was a novel experience for me. My fingers were like prunes all day, but I found washing the squash meditative and enjoyed chatting to the family members who had also been enlisted. Back to Columbus and Dine Originals Restaurant Week was in full swing. I attended a Columbus Metropolitan Club Restaurant Week event featuring a panel of Dine Originals restaurant owners and chefs. Restaurants represented were Barcelona, The Refectory, Alana’s, Katzinger’s and Trattoria Roma. The speakers were all effusive about the benefits of being part of the Dine Originals group. Kamal Boulos the owner of The Refectory and the new President of Dine Originals had some great insights into the development of the Columbus restaurant scene. There were a lot of questions from the audience, of which ‘what do you wish you had known when you started out?’ elicited the most interesting and humorous responses. I didn’t have a chance to experience any of the Restaurant Week dinner menus, but I did have lunch at two of the participating restaurants, Deepwood and Cafe Corner. My Restaurant Week highlight was tea for two at Pistacia Vera. Their Restaurant Week tasting plate made a perfect birthday treat for a friend. As usual it was all divine, but the lemon tart was so perfect that I am in need of an excuse (however transparent) to return. Wednesday was the monthly Slow Wine event at the Twisted Vine in Grandview. It is an intimate gathering, always thoughtfully put together and a pleasant way to spend an evening sipping wine and chatting to old friends and new acquaintances. The Twisted Vine offers a couple of wine flights, some complimentary food and wines by the glass or bottle. This month’s food offering was a real treat with a selection of meats, fish and cheese from Thurn’s. I think that AD and I have worked our way through almost half of Thurn’s extensive menu. The selection at the Twisted Vine included a few favorites as well as some things we had not tried. The tongue was so tender and buttery that the taste could convert people to offal but my new *favorite* thing is the 5 year old smoked cheddar. I went to buy some the next day but they were sold out. Hmpf. The North Market have revamped their Dispatch Kitchen Cooking Classes with Robin Davis, the Dispatch Food Editor now manning the helm. 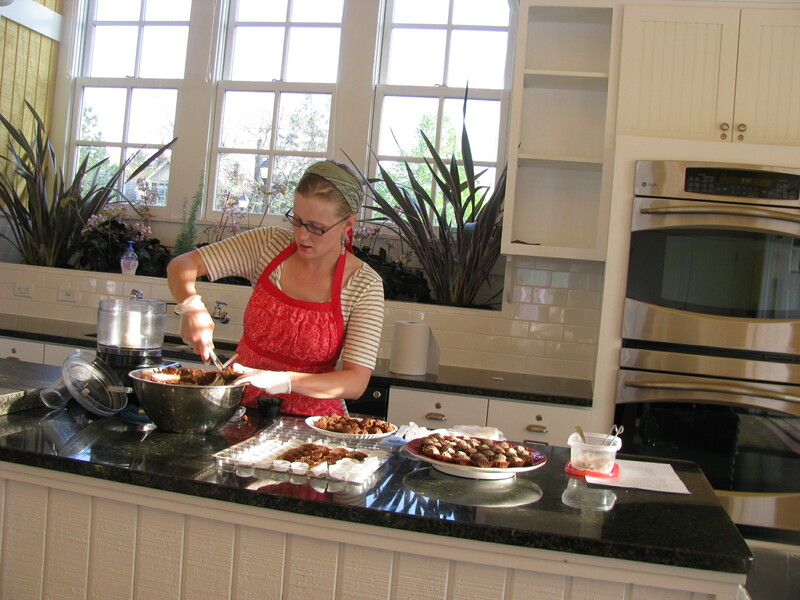 There is a great range of classes taught by Robin herself and other Columbus Chefs. There is even a timely Thanksgiving boot camp designed for people cooking a holiday dinner for the first time. I am particularly tempted by the class with Spencer Boudros of Pistacia Vera on September 30th and I believe that there are spaces left in some of the classes. They make a fun evening out or a great Christmas or birthday gift. I was a volunteer assistant at one of Robin Davis’s classes last week, on making sushi rolls at home. Robin is an informative and sympathetic teacher and it was a lot of fun. I wish I had remembered to take some photos. Friday night was a fundraiser dinner for 500 people at the Frankin Park Conservatory, part of their weekend long Field to Table Festival. Somehow I had agreed to volunteer, little realizing what that would entail, and never imagining that AD would score an invitation to the dinner. Jealous – moi?! I ended up as a sous chef to Richard Rosendale, preparing salads and plating food for 200 of the guests. Having never worked in a professional kitchen I was somewhat out of my depth, but at the same time right in my element. It was a real adrenalin rush working in a very MacGuyver-ish tent-kitchen. It was a stunning event, as befits the $300 a ticket price, with tables set out around the sculpture and the back-drop of the Conservatory illuminations. Guests arrived at the new Community Garden Campus for drinks and hors d’oeuvres which included pizza, lamb kebabs, sliders, an Ohio cheese board and Jeni’s ice cream. If they weren’t already full they walked over towards the Conservatory for a lavish 7 course dinner, including tomato and cucumber salad, ratatouille, roasted chicken, pork ribs, polenta, succotash, roasted pork loin and pork belly and for dessert apple crisp and ice wine sabayon from Pistacia Vera. Sunday we were back at Franklin Park to volunteer at the Slow Food table, promoting food that is good, clean and fair and handing out samples of paw paws and ground cherries. 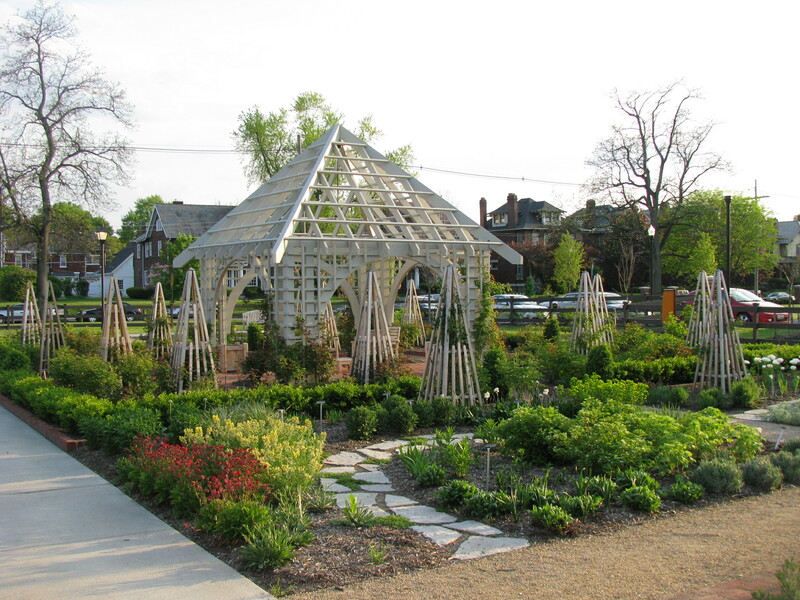 I hope that you will have a chance to visit the Community Garden Campus at Franklin Park if you have not already. I know that they are planning a lot of programming. It is beautifully done. One of the highlights of the Community Garden Campus is the live fire cooking theatre which includes a fire place, a hearth and the only green roofed pizza oven that I have ever seen. I was lucky enough to get a slice (or two) or Jim Budros’s amazing wood fired pizza topped with spinach and goat cheese. The crust was made using Peter Reinhart’s dough recipe and I can attest to the results. I am sure it helps when you have a 600º wood fired oven! As if it wasn’t a busy enough weekend, we had to find time for some taco trucking. Night of 1000 Tacos is coming up this Friday, September 18th and we had to forewarn the trucks, and drive the route so we could produce a turn by turn sheet for cyclists. We will be hitting four trucks in the Cleveland Avenue, Morse Road area and it should be a lot of fun. Last night was Taste the Future, the annual culinary showcase of Columbus State Community College. It is a huge event with around 50 Columbus chefs showing off their wares. Some of Columbus’s finest restaurants were there along with a number of hotels and catering companies. The event was held in a large courtyard area over looked by the towering statue of Christopher Columbus. There was music and wine and throngs of people. There was a lot of food and it was fun seeing what everyone had to offer. Some of the restaurants did a good job of projecting their identity and giving you a sense of their menu. With so many offerings, things started to blur but there were some interesting trends. Popular ingredients included: mushrooms, truffle oil, scallops and shrimp. There were several variations on chocolate tarts and a number of plays on gazpacho and chilled soups. Two of my favorite dishes fell into this category, a white gazpacho from the Brewers Yard Bistro at Kroger and a local tomato gazpacho with crab and corn salad from Aramark at the Columbus Convention Center. I also really liked the Scallop Pomponnette from The Refectory. It was a prefect evening for an outdoor event and great for taking photos. For those wanting more, there are a lot more photos on flickr and with several bloggers and photographers floating around, I am sure there will be a lot more online too. And so that brings us up to date. Next on the agenda is the Night of 1000 Tacos, closely followed by the Ohio Paw Paw Festival. I will be heading down to Lake Powell near Athens on Saturday for a celebration of all things paw paw. I am honored to have been invited to judge the paw paw cook off contest and I can’t wait to see what the competitors have come up with. For those of you wondering what a paw paw is – it is the largest native fruit in the United States and the official native fruit of Ohio. It is like a cross between a custard apple, mango and banana and surprisingly tropical for something grown in Ohio. I am sure that I will be writing a lot more about Paw Paws next week.